To find the best whitening toothpaste brands, I had to test over 20 different toothpastes to discover the four or five brands that worked best! This took me over a year, and I still test new products from time to time to make sure that my recommendations are up to date. Deciding which is the best teeth whitening toothpaste boiled down to several factors, which include effectiveness, taste, texture, availability and of course price. In my opinion, there are just FOUR whitening toothpastes that have a real tooth whitening effect, and ONE of them stands head and shoulders above the others! FIND OUT WHICH ONE BELOW! One thing to bear in mind is that NO toothpaste will get your teeth as white as you could achieve with a good-quality take-home tooth whitening kit, such as the SNOW whitening system. But by using the best whitening toothpaste you can certainly make a big impact on your smile! Just remember, you have to be patient, and brush your teeth slowly for at least 5 minutes with these toothpastes, to give them enough time to work properly! Here is my vote for the best teeth whitening toothpaste. Blanx White Shock Toothpaste really does produce a whitening effect if you use it for long enough, AND you use it correctly. What's my evidence? I first saw the effect on my dental hygienist's teeth. As you might expect, she does not have any staining on her teeth! So I knew that if I saw any changes in her tooth color, it would be due to real changes in the enamel, not just "fake whitening" as a result of stain removal. So, I measured the color of her front teeth with a color guide that I have in my dental office, and she started using BlanX Classic. Here is what she did; She brushed her teeth very slowly with a Cybersonic 3 toothbrush, taking a minimum of 5 minutes. This gives the BlanX plenty of "contact time" on the tooth enamel. She did this 3 times a day. She was also careful to avoid red wine, black coffee and black tea, and it helps that she doesn't smoke. After about four weeks, I thought I noticed her teeth looking quite bright, so we went to my office and did another measurement of her tooth color. Compared to the original color 4 weeks before, we saw a definite and clear whitening effect, a difference of THREE shades on my tooth whiteness guide! 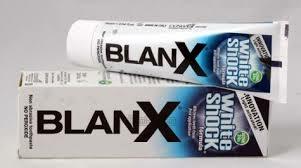 For me, this was proof enough that Blanx WhiteShock toothpaste can actually produce real tooth whitening. But you have to do EXACTLY what my hygienist did. No short-cuts. No time-saving. No skipping any steps! AND you have to keep using a BlanX White Shock toothpaste to maintain the effect. I think the current toothpaste works better with the optional LED light system, but it's not essential. 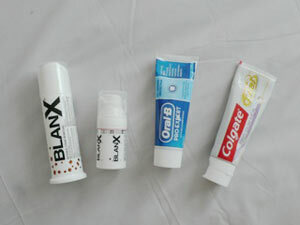 BlanX White Shock gets my recommendation as the Best Whitening Toothpaste! SO, BlanX White Shock gets my vote. BUT . . .
What other whitening toothpaste brands are there? There are a couple of other toothpastes that achieve true tooth whitening. They are cheaper than BlanX, and look attractive for this reason, but they do not get the whitening effect that BlanX White Shock does. Arm and Hammer Advance White . This toothpaste has a slightly different texture, due to the baking soda. I found that once I'd been using it for a few days it didn't bother me. This is an effective whitening toothpaste, due to it's fantastic stain removal properties - great if you drink lots of black coffee and red wine!! I do believe that it has a genuine whitening effect, with regular use. This is one of the best whitening toothpaste brands! From the makers of the dental office whitening systems. SuperSmile is really intended to back up the results you get from professional dental office whitening, but it works well on its own, too! Another toothpaste from a manufacturer of dental in-office whitening products. This toothpaste is supposed to be used after the 2 hour whitening system, but again, it works pretty well on its own. Don't bother with the matching mouthwash, I haven't seen any evidence that it does much more than using the toothpaste alone. These toothpastes are relatively abrasive, and so are better than other pastes at getting rid of staining caused by smoking. As always, they will work best with a good sonic toothbrush such as the Cybersonic 3 toothbrush. The best whitening toothpaste brands can certainly make a difference to the color of your teeth, but remember that it is going to take a few weeks to see a change, and you DO have to keep using the product to maintain the effect. If you want a more significant whitening effect, or you want whiter teeth faster, you will have to get a home tooth whitening kit from a good quality direct supplier such as the SNOW home whitening system. I have personally tested SNOW, and I think it's a great option for home whitening! I strongly recommend the Cybersonic 3 sonic toothbrush. I think it has the best performance of any brush I've tested, and you can get it at a great price (50% off!) if you use the discount code on Best Sonic Toothbrush. Here are some alternative views on Men's Health.